This was my last Glymm Box and it was a bit disappointing and made me happy with my decision to cancel. Although, I did see posts of the May 2012 Glymm Box and it looked pretty awesome – might have to re-subscribe if Glymm continues to improve. More perfume samples – eh. It does smell good (like oranges! ), but again – sick of perfume samples! Ditto for the silly shampoo and conditioner samples – like this little tiny bit is going to sell me a product. The soap is nice and cute but still it’s just a little bar of soap and can’t see how such a small bar is worth $2.00. 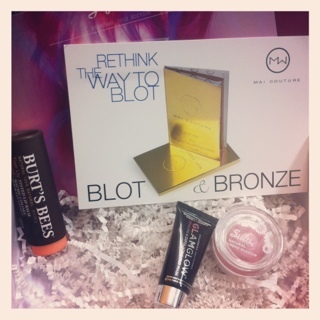 The lip gloss is the only thing going for this box. It looks like a terrible pale cream colour but when you put it is just goes on kinda clear and looks nice. It feels okay – a little thick and sticky for my liking. It does feel and look like a high end product but it doesn’t WOW me – it is by far the best thing in the box though and I am sure I will use it. There was also a card in the box to save $100 at numeonline.com – but it’s only valid on things close to $200 (hair extensions and styling tools). Not really worth it to me as I have never even heard of them before. This entry was posted in glymm box, makeup, makeup subscription and tagged glymm, glymm box, makeup, makeup subscription on May 24, 2012 by Courtnie. I know it’s May – but better late than never I suppose. I still haven’t even gotten around to trying everything yet but if I keep waiting on that I may never get this posted. The March box was pretty good. Lots of different things to try and I enjoyed almost all of them. 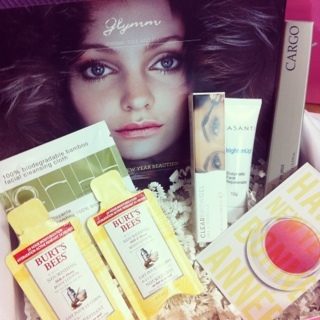 The March Glymm Box was worth close to $60 – defiantly worth the $10 (plus tax) I spent on it. The box came right at the time we decided to move the wedding ahead a year – it kind of got forgotten about for a while. Same with the Luxe Box – haven’t even opened that one up again since it came – better get on it so I can post about it. When I finally did get around it I was super excited to try M. Asam’s Magic Fini – I read a lot of reviews that it was dark but blended in fine and they were correct. I LOVE THIS PRODUCT! It goes on so nice and gives my face a bit of a glow and a nice smooth finish. I actually put it on AFTER my regular make up routine to even things out, I found I liked it better this way. A little goes a long way. I actually ordered the full size of this product right after trying it for the first time – that is how much I liked it! I had $30 in Glymm Points kicking around so I thought why not – I actually ended up ordering the combo pack with the Perfect Teint – the combo had free shipping. They just came yesterday so I haven’t had a chance to try them out. If you signed up for a Glymm Box using my referral link you will earn 100 points of your own – worth $10 in their store. I did try the Anastasia Beverly Hills Hydrafull Gloss – it’s nice, I like the colour. But I found it a bit sticky. It stayed pretty good, looked nice and smelled good but I don’t think I could justify almost $30 on such a small tube of lip gloss. I love lip products but not that much. I have only used it once so I dunno if it does everything it claims to. My bottle of Ocean’s Nail Polish is sitting on my bathroom counter just waiting for me to try it. I keep meaning to paint my toes – but that takes time I just haven’t had. The colour is nice but really dark – too dark for spring. But I will give it a try anyway – soonish. I hate the colour of the Nu.Me’s Feather Hair Extensions – I like the idea of them (have some different ones in my hair now) and was really happy to see them in my box but the colour is horrible. Ick. Not much else to say about that. 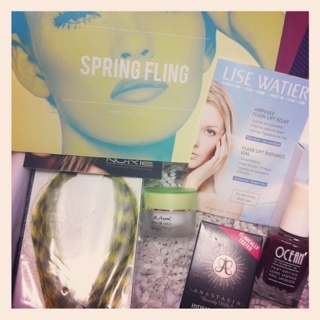 I got the Lise Watier Flash Lift Radiance in my first Glymm Box – don’t mind seeing it again though since it was a bonus. Haven’t tried it yet – haven’t tried the first one yet either. They might come in handy for some upcoming photo shoots though. All in all a pretty good box. Hopefully I will get a chance to post April’s box soon. As well as my Luxe Boxes! This entry was posted in glymm box, makeup subscription and tagged glymm box, makeup, makeup subscription on May 10, 2012 by Courtnie. This month’s Glymm box came today – pretty late but at least it make it before the end of the month. Obviously, I haven’t have a chance to try everything yet, but the items look alright. After reading some other reviews and Facebook comments it looks like a lot of people were unhappy with this month’s box – I can see why, but it really wasn’t bad to me and did include two full size products – even if they were cheaper products. Full size products are always nice. This month’s box is worth around $25 – slightly less than this month’s Luxe Box, even though the Glymm Box included two full size products. There is a promo code to get the GlamGlow Tingling and Exfoliating Mud Mask for $50 (instead of $78) – I personally don’t see myself buying it based on the price alone. The sample size is pretty small, I can’t see getting more than two tries out of it. I have read it is really nice but, it would really have to WOW me after 2 tries before I would shell out $50+ on a mud mask. I am really looking forward to giving it a try though. I did open up and try the Burt’s Bees Tinted Lip Balm right away. The colour on tissue is orangey and not very attractive but it looked alright on and felt nice. I have a seriously addiction to lip products, especially balms – so I don’t mind trying something new. Even though lip products are the last thing I really need, I do love getting them and buying more. I am not totally sure about the Sula Natural Shadow – He Loves Me Cream Eye Shadow – the colour looks nice in the container. I love shimmery eye shadows but I am not sure about a pink shimmery cream shadow on someone in their late twenties. Tempted to save this one for my much younger sister. Not sure yet though – I am interested to try it but I have never had luck with cream shadows in the past – they make my eye lids feel gross and heavy. Except the Benefit Farenheit Fab that was in my January Luxe Box, that was wonderful. So not totally sure if I am going to try this one or not. Not sure how I feel about the Mai Couture 2-1 Oil Blotting Bronzing Papier – the idea looks alright but I am not a huge bronzer user – I do like it occasionally though. The oil blotting feature sounds nice though. I like the idea that I don’t need a brush to apply it – maybe I won’t get it everywhere. I think what gets me – and everyone else, is that they only included two sheets – worth less than $0.50 – just doesn’t seem very fancy or deluxe to me. I am sure I will try these eventually but I am not overly excited to try them. Anyway overall I am happy with the box. Little disappointed about how late it came. 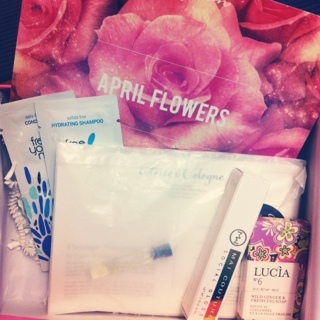 I did prefer this month’s Luxe Box – it felt most deluxe and glamorous. You can sign up for your own Glymm box here. This entry was posted in glymm box, makeup, makeup subscription and tagged glymm box, makeup, makeup subscription on February 27, 2012 by Courtnie. This Glymm shopping experiences was not a very good one. I don’t want to say it was the worst I have ever had – because in the grand scheme of things it wasn’t that bad. But it was pretty bad compared to most of the purchases online I have made. And there have been a lot. I received my January Glymm box on January 23rd. 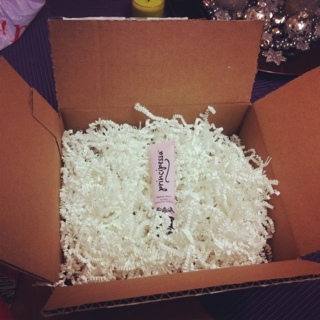 Inside the box was a promo code to recieve a free RMS Beauty Lip Shine with any order. I figured it was the perfect time to spend some of my Glymm points (thanks to my readers for signing up). I logged onto the site right away and started shopping. It took me a little while to figure out what I wanted but when I went to checkout the site didn’t work correctly. No error or anything just the page kept restarting. So I tried another browser, and another. And another computer and some more browsers. It didn’t matter what I tried I could not finish the checkout process on their website. I saw other Facebook members complaining of the same problem so I finally gave up after over an hour. The next morning I tried on a THIRD computer and was finally able to order. But of course, the free RMS Beauty Lip Shine offer was over. All sold out. Not even 12 hours after I received my Glymm Box. The next day, January 25th Glymm got more RMS Beauty Lip Shines in stock – YAY! So I was finally able to place my order. While checking out I was told I would receive 40 Glymm Points for my purchase. But when all was said and done I only received 4. I contacted Glymm to find out what happened to my 40 points. After a couple days I was credited my “40 missing points” but they never added to my total. They showed on my account but they never were really added to my spending amount if that makes sense. So I emailed them again and they told me I didn’t deserve the points in the first place because “you don’t earn Glymm Points for spending points” but I could keep the bonus points as an apology for the trouble. At this point, I had been emailing them for OVER A WEEK! I never did get those 40 points, they still show on my account as being added even though they weren’t. But after a week of emailing I was sick of talking to them. Anyway, on January 26 I got an email saying my order had been shipped. According to Canada Post I was supposed to receive it on February 3rd. By February 6th I still had no package and the tracking hadn’t updated at all. So I called Glymm to find out what was going on. They told me the Murad T-Zone Pore Refining Gel I ordered was on backorder! Seriously, you can send me an email to tell you shipped something you haven’t but you can’t send me an email to tell me what I ordered was on back order? For real. The person on the phone was super friendly, but I still can’t believe I was notified it shipped when it hadn’t. On February 9th I get a second shipping notification – this time it really showed up, on February 16th. 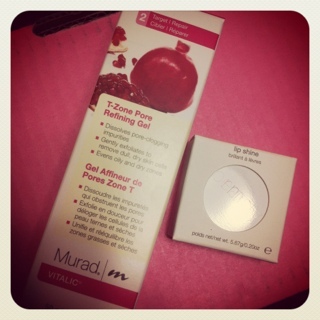 Both items were “free”, all I had to do was pay the tax and shipping on the Murad T-Zone Pore Refining Gel ($11.46). They weren’t really free, I had to spend my 400 Glymm points to get them but still. All in all I am happy with my order. But Glymm has some serious work to do. On top of their seriously half broken website that they refuse to address – they only seem to answer and/or receive half the emails you send AND they disabled their Facebook wall. In order to contact them you must email and hope they get it or call and hope the line isn’t busy. I am okay with both of those options but they should work! I would say about 3 out of 5 emails I have sent have been answered. I don’t think they are ignoring emails – I think they are not getting them. Before they turned off their Facebook wall it was flooded with people saying the website didn’t work and their emails weren’t being answer. To me that is a sign that something is SERIOUSLY wrong. I would like to note here, that I make websites for a living. I also fix bugs and test for bugs for a pretty big online company. So if I say there is something wrong with a website there really is. Not to mention telling a customer to try a different browser because nothing works in Google Chrome? What a load of… anyway, I use Google Chrome all the time and never have a problem. Not mention their website also didn’t work in IE8, IE9, FireFox… Anyway, Glymm really needs to step up. You can’t survive on a good product alone. They need a more reliable website and better customer service. I took a lot of time writing them emails about all the problems with their website trying to help them and at least point out the bugs – go figure, I never got a reply. Last week I was able to get myself on the wait list for the June Topbox. I am pretty sure once that starts coming I will be done with Glymm – if not before then. I love the boxes and I love the points but I just can’t get past all the issues. When I went to do my January box surveys I never got my points. I had to email them for that too. I also don’t think the referral links were working correctly – they may be now, I have no way to test but they weren’t a couple weeks ago. If for some unknown reason this post has made you want to try Glymm for yourself, here is my referral link – you do get 100 points for signing up (worth $10). Websites are allowed to have problems. It’s okay. BUT ADMIT IT. ADRESS IT! Post a message on your Facebook or Twitter or something – that is what it is for. “We are aware that some members are having issues with certain areas of our website. Please bare with us while we try and resolve these issues.” – something, anything is better than pretending the problems don’t exist. It makes it feel like they are blaming the customers and calling them stupid when in this case it is clearly a problem on their end. Maybe if they just keep their eyes closed the problems will resolve themselves. PS – it is possible Glymm MAY have fixed these problems by now… one would hope anyway – I haven’t tested and since they turned their Facebook wall off for comments I can’t see if people are still having problems. This entry was posted in glymm box, makeup subscription and tagged glymm box, makeup subscription on February 21, 2012 by Courtnie. My Glymm box came last week, it was really the only thing I got in the mail all week – other then some coupons. The Kaia Naturals Juicy Bamboo Cleansing Cloths sound really great but I think it will be hard to tell with only one cloth. Also, they are pretty expensive. Even the more expensive ones in Walmart don’t cost as much. I usually buy the ones at Dollarama – you get 25 for $1.25 plus tax. You really can not beat the price and they work pretty good. Looking forward to trying this one but really don’t see myself spending almost $20 with tax on one month of cleaning cloths; that is about how much I spend on them in an entire year right now. Probably won’t use the Cargo Cosmestics Eye Pencil. The colour is “wood” a very pale brown/tan colour. I normally use black or even dark brown eyeliner and this is just way too pale. I saw that these are also good for eyebrow pencils but that doesn’t work for me either because mine are almost black. Some people were lucky and got black but all well – that’s the fun of a surprise box! I really like the Anastasia Beverly Hills Clean Brow Gel. It makes my eyebrows look great and doesn’t make them too hard and crunchy. Thinking about buying one of these – hoping I can get one more referral before tomorrow so I can combine 100 points with the $10 promo code from the December box, thus making it only $7 (and free shipping!). The card in the box says it is $21, but it is $27 on the site. :( So if you are thinking about joining Glymm and want to help another girl out, here is my referral link. Dont forgot you also get 100 points for signing up with my link and that is good for $10! If you sign up before the end of tomorrow you could probably use the $10 promo code too (giving you $20 to spend), it is GIFT4U but is only good until the end of tomorrow. Haven’t tried the Vasanti Cosmetics BrighgtenUp! Face Rejuvenator or Burt’s Bees Nourishing Milk & Honey Lotion yet, but I will tonight/tomorrow and come back and update. The little cardboard things of the lotion seem kind of cheesy and cheap, not any better than perfume samples in my opinion but I have heard it is nice lotion. There was also a card in the box with a promo code for a free RMS Beauty Lip Shine in the colour Bloom with any Glymm store purchase. I was pretty frustrated by this. The day I got my box I tried to place an order but the website didn’t work. I tried on multiple computers and multiple browsers and never could order. I sent in an email and still almost a week later haven’t heard anything about that problem. The next morning I tried to order on ANOTHER computer/browser combo and finally got it to work – only to find out they were out of lip shines. I was a little upset because for one, lots of people hadn’t even got their box yet and they were out of them. And their website didn’t even work so I could order. I saw lots of people on their Facebook having problems with the website too and Glymm never did address it – there were a lot of angry people. Anyway, the next day they had more lip shines in stock (go figure) so I was able to order and get my free lip shine; all was well in the end. I was able to place my order for free – I just had to pay tax and shipping. Thanks to my awesome Glymm points! That order will hopefully be here by the end of this week so I can post about it. Anyway, I would say this month’s Glymm box was sort of worth it. The Anastasia Beverly Hills Clean Brow Gel is worth around $8 for the size and the full size eye pencil (even if I won’t use it) is worth $16. So you I did get my money’s worth. Disclosure: I just want to add that these opinions are my own, I am in no way affiliated with Glymm or earn anything for these posts (ie. I am not paid). The only benefit I get is 50 points, if one of you use my referral link – thank you to those who have – I really appreciate it. UPDATE 01/31/12 – tried the last couple things this morning. The Vasanti Cosmetics BrighgtenUp! Face Rejuvenator felt amazing, the tiny little micro scrubbers were just perfect. I could totally see myself buying this. Years ago I used a similar feeling face wash, but for the life of me I can’t remember the name. The full size is a little pricy but you only need a VERY small amount. I did not like the Burt’s Bees Nourishing Milk & Honey Lotion – it smells gross and took a while to massage into my skin. I felt like the lotion could of been a bit thicker or something, I dunno. Once it was all rubbed in it felt fine, but I wouldn’t buy this because of the smell alone – plus the St. Ives feels and smells much nicer and sells for 1/4 of the price (when on sale.) I also tried the Cargo Cosmestics Eye Pencil on my top eye lid this morning, the colour was still bad – you can hardly see it but it went on nice. Definitely wouldn’t buy, least not in Wood colour. This entry was posted in glymm box, makeup, makeup subscription and tagged glymm, glymm box, makeup, makeup subscription on January 30, 2012 by Courtnie. When you sign up for a monthly Glymm box using a referral link you get 100 Glymm Points that is good for $10 on their online website. I decide to try out shopping with them and it was pretty good. I was a little disappointed in the shipping cost of a lip balm, it probably would of been close to the same price to find this stuff in stores even with using my points but I decided to order it anyway. The Principessa Beauty – Bacio Me Lip Balm Tube sells for $11.00 on the Glymm websites. Using my 100 points from signing up it brought the cost down to $1.00. With shipping and taxes it ended up costing me $8.98 – so I did save a bit of money. But $6 to ship a lip balm seemed a bit high to me. No wonder it was $6 for shipping! Look at the size of that box. What a waste. The little paper bits actually came in handy later for wrapping a present though. Seriously, HUGE box for a little lip balm. Huge box aside I was happy with how fast they shipped it, especially close to Christmas. And the Glymm points program is awesome from what I have seen so far. The Principessa Beauty – Bacio Me Lip Balm Tube itself isn’t bad. It smells really nice and goes on nice but it doesn’t last, at all. I feel like I need to constantly reapply it. I was hoping it would last a little bit for its regular price of $11.00 – and all the reviews I read were great. But I feel like it doesn’t stay on your lips long enough to really help them. Unless you put it on every few minutes – but it does have a really nice light sweet smell. If you are looking to sign up for a monthly Glymm box here is my referral link – if you don’t use a link you will not get the 100 points. If you know a friend with Glymm you can ask them for their link too, using their link will give them 50 points as well. This entry was posted in glymm box, makeup, makeup subscription, review and tagged glymm box, makeup, makeup subscription, review on January 19, 2012 by Courtnie. This was my first Glymm box so I am not sure what I was expecting but I am happy with it. The only disappointing thing really was that I got two hand creams, getting two in one box is a bit disappointing but not the end of the world. The idea is to try new stuff. The perfume sample was a bit meh too, especially after getting two in my Luxe Box. Also, my sister got a really cute perfume sample in hers in this cute box and in a cute little bottle – I really liked the way hers was packaged. I did like that the box had a full size lip gloss. The Ahava Mineral Hand Cream has a nice smell to it haven’t tried it yet though. The perfume smells alright. Eventually I am going to have to decide what box I like better, getting two every month seems a bit silly. I did like the $10 card in this month’s box, thinking about seeing if I can combine that with some of my Glymm Points and order myself something free on their website store. I like free! I already ordered a free lip gloss with some of my points. Do really like their points system. This entry was posted in fun, glymm box, mail, makeup, makeup subscription and tagged fun, glymm box, mail, makeup, makeup subscription on December 31, 2011 by Courtnie.